The giant Chee-to shown next to a quarter and a regular-sized Chee-to. If you love cheese, this is the Chee-to for you. It's beyond dangerously cheesy. (CNN) -- It's believed to be the largest Chee-to in the world. The cheesy glob of fried cornmeal that Navy Petty Officer Mike Evans found last week in a bag of the snacks is about the size of a small lemon and weighs in at about half an ounce. Evans, 41, a fervent user of online auctions, posted his find on eBay. He never expected the flurry of attention that followed. 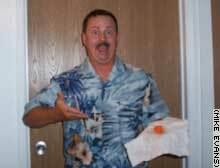 Radio stations from around the country interviewed Evans, a Gulf War veteran stationed in Pearl Harbor who patiently explained that he bought the bag of Chee-tos for his 3-year-old son. Giant Chee-to T-shirts and Chee-to puppet auctions sprung up online. And pranksters bid up the Chee-to into the millions of dollars -- so much that eBay cancelled the sale and a frustrated Evans donated the Chee-to to a good cause: a sleepy farming community in Iowa. "I was absolutely astounded that something like a Chee-to could become a pop icon," said Evans. "It's international. I've even seen it online on a Russian site." Chee-tos were introduced by the Frito Company in 1948. 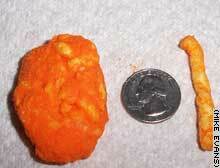 Frito-Lay sells about 1 billion bags a of Chee-tos a year. About 15 million pounds of cheese are used every year in making the snacks. The folks in Algona, Iowa -- a one-movie-theater town with 5,970 residents -- can hardly wait to get their hands on the giant Chee-to. They plan to shellac it, lay it on plush velvet and put it under Plexiglas. "This giant Chee-to could be a boon to our local economy," said Tom Straub, owner of Algona's Sister Sarah's Bar. "Anything we can do to attract visitors to our town would be good." Though no official records are kept of such finds, a spokeswoman for Frito-Lay said she doesn't recall such a big Chee-to ever making it through the rigorous quality control process since the company began making them 55 years ago. A rare thing indeed because snackers devour billions of Chee-tos every year. More than 3 million bags are made daily, making the tasty treat almost synonymous with America. "We have very high standards and practices in place," Frito-Lay's Lynn Markley said. "It's never happened before. Not in our lifetime." Mike Evans has some fun with his Chee-to discovery. So how did this one Chee-to get to be a behemoth? Chee-tos Development Manager Kevin Cogan's job is to ponder such mysteries. He believes that some of the cheddar seasoning in the company's machines built up and plopped out in a big blob that sneaked past inspectors. "We call it Seasoning Accumulation," Cogan said. "If you love cheese, this is the Chee-to for you. It's beyond dangerously cheesy." Bryce Wilson, the radio station disc jockey who headed the campaign to bring the Chee-to to Algona, said no one in the town would dare think of tasting it. Town residents raised $180 to bid on the Chee-to, but when Evans found out, he decided to send it to them for free. The $180 -- along with another $1000 pledged by Frito-Lay -- will go to a local food bank. "If you take a big chunk of food out of circulation, you should put some food in circulation," said Wilson, 24, who has contacted the folks at Guinness World Records to see if the Chee-to qualifies. "Best of all, in these uncertain times, having something to laugh at is a really good thing."